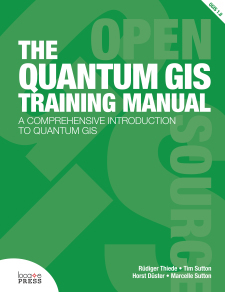 Years of experience in a single book─the official Quantum GIS Training Manual written by seasoned trainers. It's the jump-start you need to learn this incredibly popular free desktop mapping and GIS toolset. Comprehensive and structured, your introduction begins with a quick download of example data, making it easy for you to work your way through the concepts and practical exercises, complete with answers and examples. Ideal for classroom instruction and self-guided learning, included are all the materials needed to run a five day course on Quantum GIS, PostgreSQL and PostGIS. Content is structured for novice, intermediate and advanced users alike. Seasoned Quantum GIS users will also find tips and new techniques to apply to every mapping project. Windows, Mac OS X, or Linux? It's your choice, this book works for all. Locate Press is proud to publish this color paperback edition of the QGIS Training Manual, based on the original open source documentation by Linfiniti Consulting. The manual also includes a complete answer sheet for each of the exercises. Example data (zip file, 41M). Online versions of the manual are always available, as is the original source code. If you would like to receive updates about this title, please subscribe.